I hate clichés, but what is more American than apple pie? We have to have this in our list of classic recipes. There are a thousand little variations usually with names like Grandma’s apple pie or Aunt Rosie’s famous recipe. They are all good, I’m sure, but this recipe below is mind blowing good and very easy. I adapted it from one that I found on AllRecipes.com (a great site) from someone named Moshasmama. 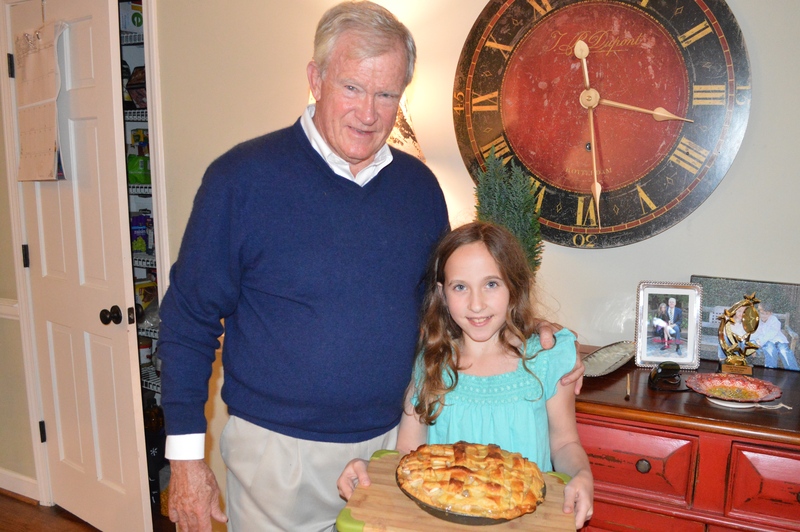 The highlight of this pie is the carmel sauce, which is poured over and through a lattice crust top. The end result tastes as good as it looks. For those of us old enough to remember, think Bo Derek in “10”. Here’s how to make it. Make a pie crust following our recipe for the The One-Handed Pie Crust. Don’t cheat and buy a crust in the store. Those things are usually made with lard (where does that come from???) and have preservatives with names that you can’t pronounce. It takes about 15 minutes max to make your own crust. You can make your life much easier if you buy one of these crazy machines that peels, cores and slices your apples all at once. 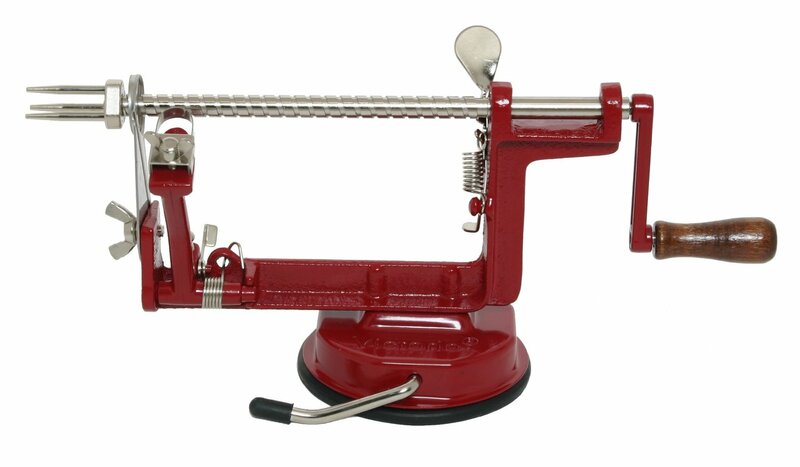 I like the VICTORIO VKP1010 Apple and Potato Peeler that you can get at Amazon for about $20. It is well worth it. With this little device, I did all of the apples in under minutes. There are a few other things that I can do in under ten minutes, but they don’t lead to a great apple pie. Take 2/3 of the pie crust and roll out so that it fits into the bottom of a 9” pie pan. Put in the fridge until ready to bake. Melt the butter in a small sauce pan on medium heat, gradually add the flour, stirring constantly. Add the sugars slowly, stirring constantly. Add the water, stir well and bring to a boil for two minutes. Turn off the heat and let cool. You have made your first caramel sauce. Roll out the remaining dough and slice into strips about ¾” wide. 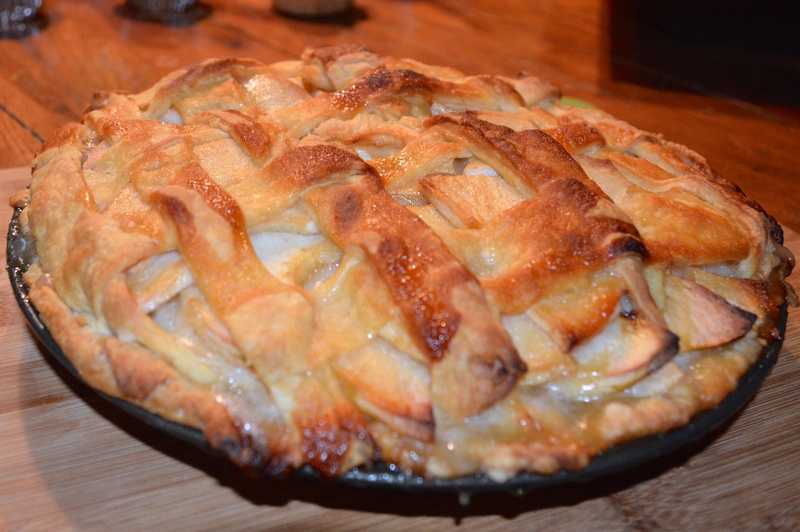 Using a circular, overlapping pattern, arrange the apples neatly in the crust in the pie pan. Heap them up. Weave the strips on the top leaving some open space between the strips of crust. Pour the caramel mixture slowly over the top, trying to get most of it into the open spaces. Dribble the final drops all over the top crust strips. Bake for 15 minutes, lower the temperature to 350 degrees and bake for 35 minutes more. Make sure that you show off this beautiful dish when it comes out of the oven. The crowd will go wild. If there are any leftovers the next day, make sure you warm the pie in the microwave or oven. The caramel sauce needs to be a little warm.